Lowering kit for Kawasaki Ninja 125 by Lust Racing Ltd. Our Kawasaki Ninja lowering links are made of SS400 super strength tensile steel. The links "dogbones" in the kit replaces the stock rear suspension links on the Kawasaki Ninja 125. With a lowering kit young, short and lighter riders find the bike a lot easier to handle the bike with confidence. Lowers the rear suspension and the seat height the specified amount. Our lowering kits below fit all Kawasaki Ninja 125 models manufactured from 2019 to present. 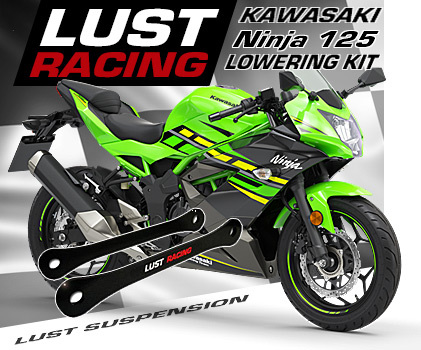 Buy your 2019 Kawasaki Ninja 125 lowering kit factory direct from Lust Racing.